The Carolina Recycling Association, SC Department of Health and Environmental Control, the NC Division of Environmental Assistance and Outreach and the US Environmental Protection Agency - Region 4 are pleased to present the 2nd Annual Southeast Construction and Demolition Recycling Conference. 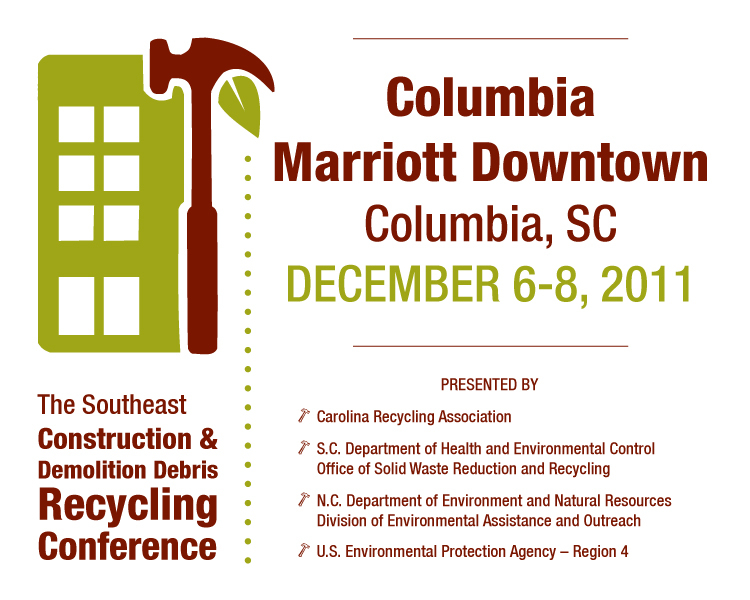 Join us December 6-8, 2011 at the Marriott in Downtown Columbia for an in-depth exploration into all things C&D Recycling. Exhibiting at the C&D Conference is a great way to showcase your company's products and services. Registering as an exhibitor is easy. Simply click on the registration type that applies to you, as a member or non-member. Additional registrant: Exhibitors have one registrations included with one booth. Additional exhibitor registrations are offered a special discounted price of $150. Additional exhibitor registrations can be added to your registration by clicking on "add guest." The $150 will be added to your invoice. For more information, please view the exhibitor brochure. Our sponsors are the key partners of the C&D Recycling Conference. We offer a number of benefits associated with each sponsorship level including memberships, registrations and more. Please view the sponsorship brochure for details. To register as a sponsor, please contact Rebecca Coplin at 336-883-3632 or email at rebecca.coplin@highpointnc.gov. Member/Non-member Rates: CRA is using a new member and event management system, allowing us to keep your membership and event registration activity in one account. When you click on the "Register Now" button, you will be asked for your email address to begin registering. If your email address is associated with a membership within our system, you will automatically be offered membership rates for all registration types. If your email address is not associated with a membership within our system, and you are not a member but wish to join CRA, please visit the Join CRA page and complete a membership application. When you log back into this event, member registration rates will be available. If your email address is not associated with a membership within our system, but your organization is a member, please contact CRA staff at 877-972-0007 or staff@cra-recycle.org. We will help resolve the discrepancy. Deadline for sponsors to sign up, provide logos for program. Prior to October 28th, sponsors will have first choice of booths, offered on a first come, first serve basis. Exhibitors will begin booth selection. CRA staff will contact exhibitors in order of registration date to assign booths. Note: exhibitors may and are encouraged to register prior to October 28th. Book by calling Marriott Columbia: 800-593-6465 and mention group "Carolina Recycling Association"